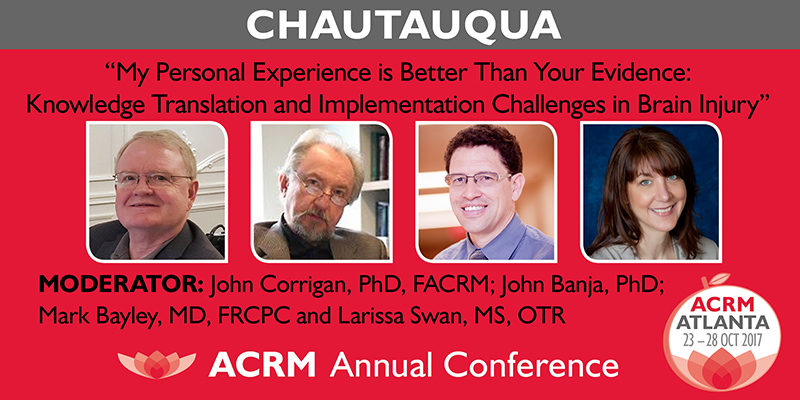 In this interactive session, the presenters will lead a thought-provoking discussion about impediments to translation and implementation of brain injury research and share their experiences with these efforts, focusing on potential solutions and strategies to overcome the barriers to advance evidence-based care. John Banja is a Professor in the Department of Rehabilitation Medicine and a medical ethicist at the Center for Ethics at Emory University. He also directs the ethics program of the Atlanta Clinical and Translational Research Institute. Dr. Banja received a doctorate degree in philosophy from Fordham University and has taught and lectured on topics in medical ethics throughout the United States. He has authored or coauthored over 200 publications and has delivered over 800 invited presentations at regional, national, and international conferences. He currently serves as the Editor of the American Journal of Bioethics-Neuroscience, the leading scholarly journal in the field of neuroethics. Dr. Banja has conducted research or educational projects with numerous federal and private organizations including the NIH, the American College of Surgeons, The Agency for Health Care Research and Quality, The National Institute for Disability and Rehabilitation Research, the American Society for Healthcare Risk Management, and the American Society of Bioethics and Humanities. He is a former board member of the Commission for Case Manager Certification as well as the American Society of Cataract and Refractive Surgery. His research interests include topics in patient safety, neuroethics, and ethical dilemmas occurring in clinical and translational research. Mark Bayley is currently Medical Director and Senior Scientist at the Brain and Spinal Cord Rehabilitation Program at Toronto Rehab. He is Professor and Saunderson Family Chair in Brain injury Research in the Division of Physical Medicine and Rehabilitation, Faculty of Medicine at the University of Toronto. Mark’s research focuses on understanding how to speed brain recovery through exercise, virtual reality, telerehabilitation and functional electrical stimulation. Importantly, he has explored novel implementation strategies to bridge the knowledge-practice gap by making best evidence available to clinicians through smartphone apps (www.viatherapy.org) and Best Practices guidelines in stroke, concussion and Brain injury. He is co-author of the Best Practice Guidelines for the Management of Persistent Symptoms after Mild Traumatic Brain injury. He also led the international Cognitive Rehabilitation (INCOG) best practice guideline group published in the Journal of Head Trauma Rehabilitation. He is co-author of the Evidence Based review of Acquired Brain injury Rehabilitation and Co-Principal investigators the Ontario Neuro Trauma Foundation (ONF) and Institut National Excellence de Services Santé de Quebec (INESS) Traumatic Brain injury guideline development project. His work has helped redesign the stroke and brain injury rehabilitation systems in Canada. Larissa Swan serves as the Executive Director of Therapy Services at Rehabilitation Hospital of Indiana. She leads and assists in the revision of program models incorporating evidence-based systems of knowledge transfer into the development of brain injury and stroke programming throughout the continuum of care. She introduced evidence-based Implementation and knowledge transfer strategies which are regularly applied to integrate cognitive rehabilitation and therapeutic techniques into the service delivery system and assure sustainability and fidelity to evidence-based interventions. Through both short-term and strategic planning, programs are structured to reflect state-of-the-science methods and to optimize care. With Dr. Jim Malec, she recently developed a manual to guide the translation of research into practice entitled, “Research to Practice: A step-by-step guide to clinical implementation.” Ms. Swan is actively involved in research and supported the development of the research program at RHI. She currently leads an international committee within the American Congress of Rehabilitation Medicine (ACRM) to develop an integrative knowledge translation model specific to cognitive rehabilitation. She currently sits on the Indiana University and Purdue University occupational therapy advisory council. She guest lectures to current students regarding the role of occupational therapy across the continuum of care.